Our man DSK, takes a listen to the new Baroness track Clorine & Wine, to get a sense of what to expect from the Atlanta four piece’s forthcoming album “Purple”. Baroness has a knack of writing the best album intro’s I’ve ever heard. From the Red Album, right through to double LP Yellow & Green, they just have a gift of catching your attention from the opening note. Chlorine and Wine is the first introduction we are getting to Purple, their new LP due out in mid December. It is uplifting, melodic, grungy, experimental and straight up heavy all at the same time. A haunting piano intro opens the song in a pleasant and refreshing way. 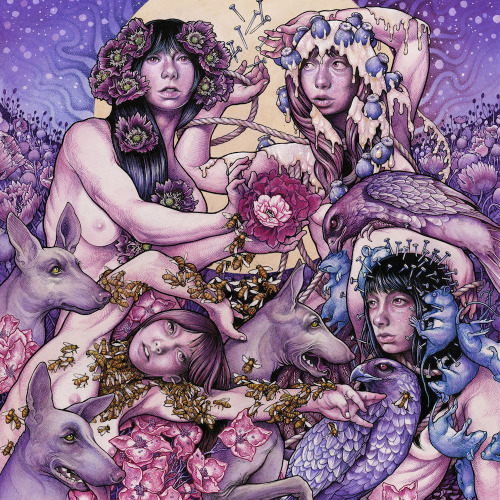 In a time where a lot of music is made to grab you by the balls and not let go till you’re crying for mercy, Baroness decide to take a step back, catch their breath and deliver an absolutely beautiful piece of music that fills you with a sense of calm. This band clearly doesn’t want to rush into anything with this song, which is apparent, as it is 2:11 before we hear any vocals. When front man John Baizley does arrives with his powerful and raspy vocal the song lifts and truly takes off. This is Baroness on top form. The main riff that was teased all the way through the slow winding intro comes into focus here with distorted guitars and heavy drums. New boy Sebastian Thomson shines behind the kit here. Creating a sense of urgency after the slow meandering intro. This song goes through stages that keep you hooked to see where they will go next. Right to the end you’re kept wondering as to where they will go next. Then it abruptly ends. I have a feeling this is an album much like the Blue album, in that you simply cannot listen to just one song. This will be a story. This will be a record to sit down and just listen to. This is Purple. For more information on Baroness, just click this link. Check out our video of the week to the right for a new track from the album Shock Me. The album will be released on December 18th via the bands own label Abraxan Hymns. To pre-order your copy of Purple, simply click on this link.